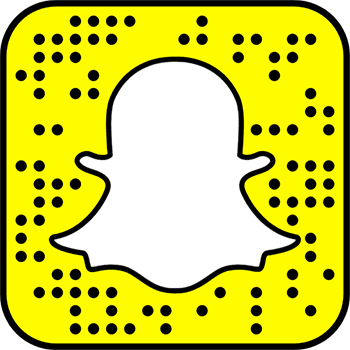 The Board of Trustees appropriates $500 for "library purposes" and $150 for subscriptions for magazines, newspapers, and other periodicals. 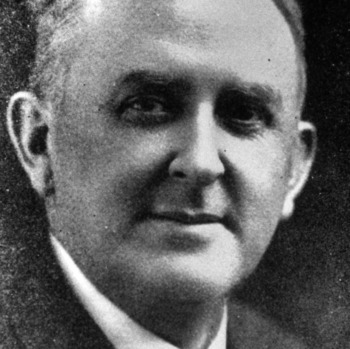 E. B. Owen (Class of 1898), was hired in 1899, along with University of Texas librarian Benjamin Wyche, to implement the Dewey system of book classification, construct a card catalog, and institute a card loan system. He served in this capacity until 1902. He held a variety of other positions at the college, including teacher of college preparatory classes (1898-1901), English professor (1904-1907), proctor, registrar (1907-1928), and the first alumni secretary / editor of the Alumni News (1928-1930), a publication he had established during World War I.
Haywood served in 1902-1903, during which time he worked on his book, "William Tryon and his Administration in the Province of North Carolina, 1765-1771" (1903). Haywood resigned when college president G. T. Winston cut his already low salary. 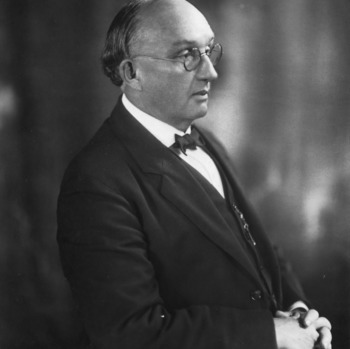 He later became a noted author of North Carolina history and librarian of the North Carolina Supreme Court (1918-1933). The library holdings move from Holladay Hall to the first floor of the old Pullen Hall. President D. H. Hill appointed English professors Thomas P. Harrison and George Summey as co-chairs of the Library Committee. Harrison and Summey departed from Hill’s solitary approach to book selection, instead asking faculty to recommend titles for the collection. Before becoming State College's librarian, Williamson had served as a Raleigh high school teacher and principal of Murphey School. During her time as librarian, the collection continued to grow slowly. 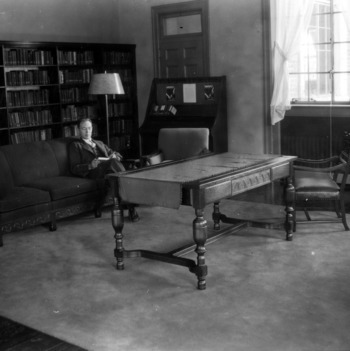 Although James R. Gulledge was named head librarian in 1923, Williamson remained on staff until 1937. Library holdings include 7,500 print volumes and 150 magazine and journal subscriptions. Among lasting changes made during Gulledge’s tenure were the library’s designation as a depository for U.S. government publications and presentation of the first formal library instruction for classes and individual students. Contract for construction of a new library building (now Brooks Hall) is awarded to Joe W. Stout & Company, at a cost of $227,500. After a fire destroyed the library's card catalog, librarian James Gulledge changes the book classification system from Dewey Decimal to the Library of Congress System (still in use). Procedures for interlibrary lending are first instituted. 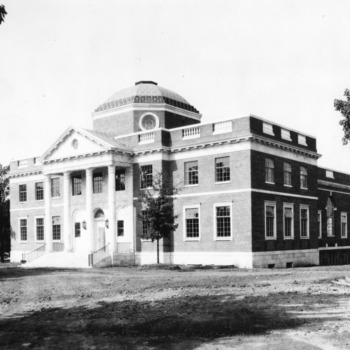 The original D.H. Hill Library is dedicated (this building later became Brooks Hall). The contents of the library had been moved into the building the previous autumn, marking the first time there was an entire building designated as the library. 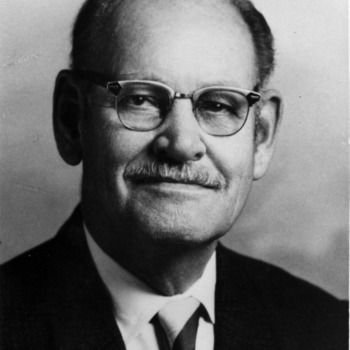 Hugh T. Lefler, head of the History Department and chair of the Library Committee, became acting director of the library until the following year. State College joins UNC-Chapel Hill and Duke University in contributing catalog cards to the North Carolina Union Catalog, the first collaborative effort between the three libraries. D. H. Hill Library is given a private engineering library of more than 1,000 books by the widow of Colonel J.L. Ludlow of Winston-Salem. During his administration, Kellam brought a sense of professionalism and organization to the library: the number of formally trained librarians grew from one to seven; the number of books increased from 33,500 to 56,500; circulation climbed from 60,400 to 97,900 volumes; and expenditures rose from $6,900 to $10,000. 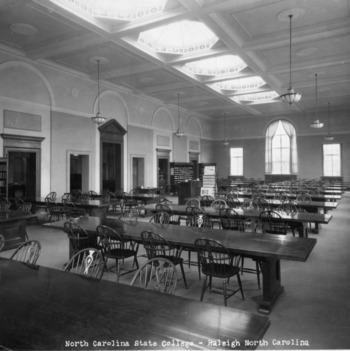 Kellam arranged the library into departments by function: circulation, reference, ordering, cataloging, and periodicals. Further increasing efficiency, Kellam centralized the acquisition of books and periodical subscriptions, a function that had been distributed among academic departments. 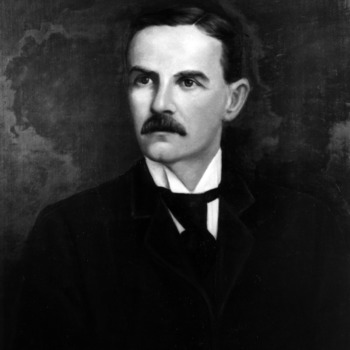 Clyde Hull Cantrell became the first periodicals and binding librarian. 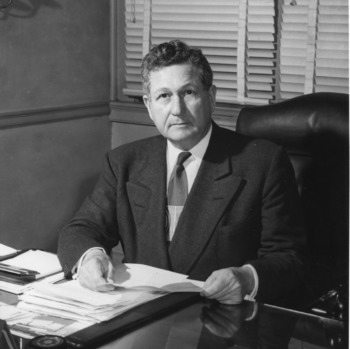 Harlan Brown joined the library in 1936 as the circulation librarian, After becoming director in 1939, he presided over many significant changes for the library, including its 1954 relocation from Brooks Hall to the facility where it remains today. The larger space provided Brown with the room to expand the collection from 50,000 to 500,000 volumes, construct a comprehensive scientific periodical collection, and acquire the renowned Tippman Collection of Entomology volumes. 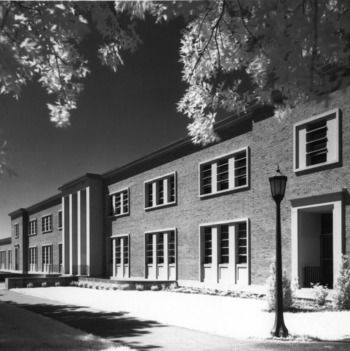 The enhanced D. H. Hill Library formed part of Brown's vision of a centralized campus library system. From 1942 to 1946, Brown took a leave of absence to serve in World War II. Brown became associate director in 1964 and retired in 1971. As State College celebrates its fiftieth anniversary, materials on the institution's history begin to be collected in the library. This forms the basis of what would later become the University Archives. L. C. and M. M. Glenn donate $6,000 to State College for the library's purchase of geological publications, many rare and unique. In acquiring the L. C. Glenn Geological Collection, the Friends of the Library organization is formed. Former Chancellor John Harrelson begins an appointment as the head of the University Archives collection at the D.H. Hill Library. 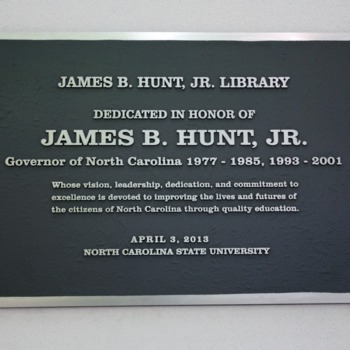 The new D. H. Hill Library (the east wing of the current building) was formally dedicated. The library publishes its first newsletter, The Bookmark. The Friends of the Library program is reestablished after being largely inactive since the late 1940s. 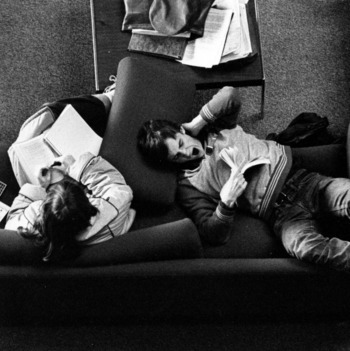 The college made librarians the same status as faculty. The library received the Eugene Clyde Brooks collection of approximately 1,000 books and journals on the history of education and North Carolina. 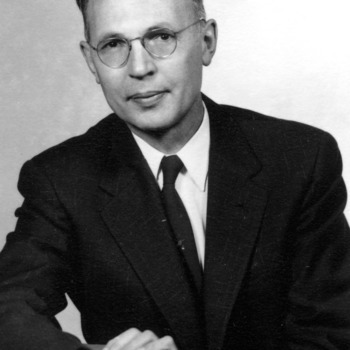 I. T. Littleton had joined the library in 1959 as assistant director. He became director in 1964, at first in an acting role (Harlan Brown remained, serving as associate director until his retirement in 1971). 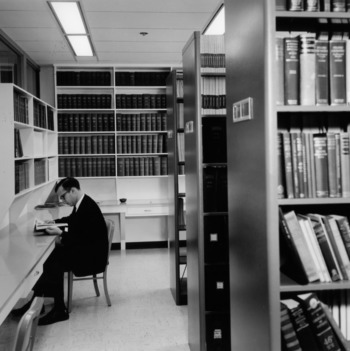 During Littlton's long tenure as director (1964-1987), he built the D. H. Hill Library and its branches into a major university research library system: the book, periodicals, and binding budget rose from $114,000 in 1958 to $3.1 million; and the library's full-time staff and facilities tripled in size. The library added its cataloging records to the international bibliographic network OCLC, and it served as a founding member of several cooperative organizations. 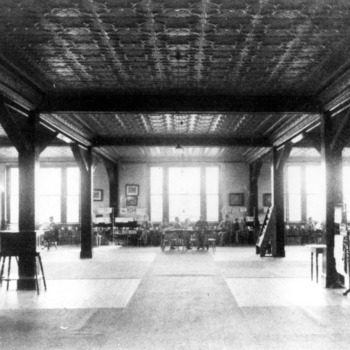 Air conditioning was first installed in the D. H. Hill Library. Maurice Toler becomes the first professionally trained, full-time University Archivist. 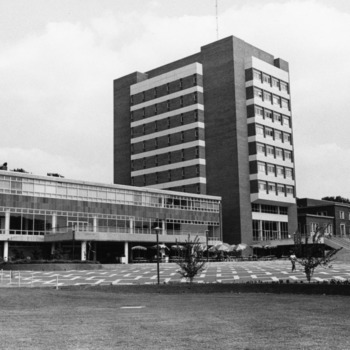 While the university archives were housed in the library, the division initially reported directly to the Dean of Faculty (later titled Provost). 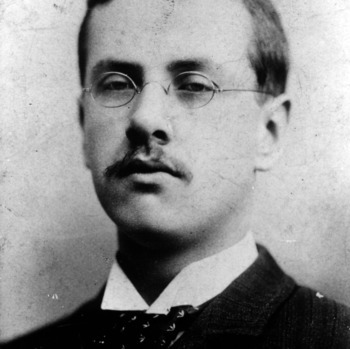 William C. Horner becomes the first systems librarian. The North Carolina General Assembly maked an appropriation for funding of libraries at the sixteen senior public institutions of higher education in the state. 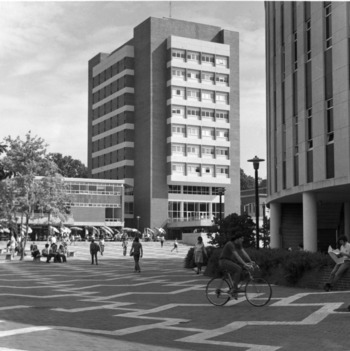 NC State received an increase of $723,915, resulting in a budget of $1,313,833 for fiscal year 1970-1971. The budget for books, periodicals, and binding increased to $624,123. A single entrance to the library (from the Brickyard) is established for the first time. 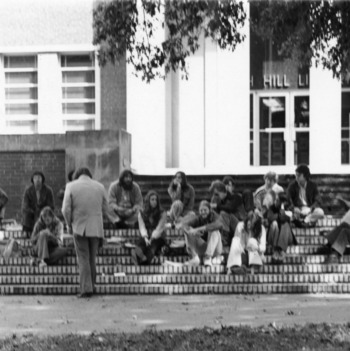 Class meeting outside main entrance to D. H. Hill Library. A reorganization of departments in the Libraries results in three major divisions headed by assistant directors. The divisions were General Services (including circulation), Reference Services, and Collection Development and Organization (including technical services). The school libraries - Design, Textiles, and Forest Resources - were now classified as branch libraries. 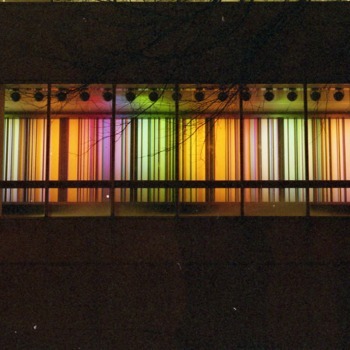 The light mural (later known as the Color Wall) in D. H. Hill Library was activated for the first time, but not yet fully completed. The mural was created by Joe Cox, a faculty member in the School of Design. Construction ended on the new 11-story tower addition (North Tower) to the D.H. Hill Library. 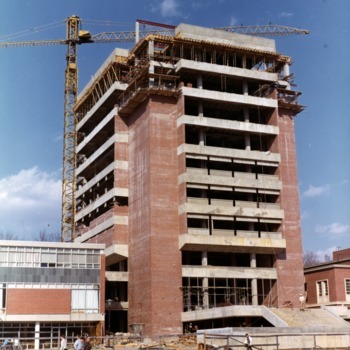 The original 11-story bookstack tower (now the North Tower) of the D. H. Hill Library is dedicated. With the addition, the bookstacks are opened to all users (previously, the library had had closed bookstacks). NC State became a charter member of the Southeastern Library Network (SOLINET). Library Director I.T. Littleton served on SOLINET's initial board of directors and chaired its first bylaws committee. The D.H. Hill Librarians group met for the first time. 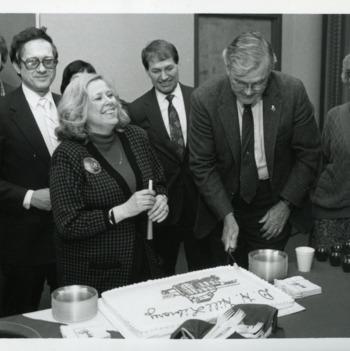 In 1984, the group was renamed the NCSU Librarians' Association. The library began computerized cataloging of materials. Retrospective conversion of the card catalog was started the following year. Book, periodical, and binding expenditures exceed $1,000,000 in a fiscal year for the first time. A Rare Book and Special Collections Room, administered by the Reference Department, was established adjacent to the University Archives. The library directors at NCSU, UNC-Chapel Hill, and Duke University appointed a Triangle Universities Library Cooperation Committee (TULCC) to plan a cooperative program for the three universities. Ultimately the Triangle Research Libraries Network (TRLN) grew out of this effort. D.H. Hill Library holdings reached 1,000,000 volumes. The NCSU Libraries became a member of the prestigious Association of Research Libraries (ARL). The online catalog became operational in 1986. 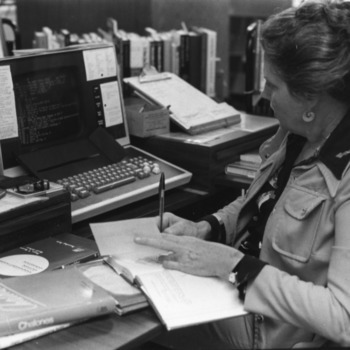 It was originally called the Bibliographic Information System (BIS). 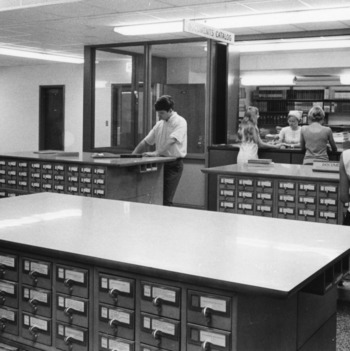 In 1987, library staff stopped filing cards into the card catalog. In addition to providing information on NCSU holdings, BIS also gave users access to information on holdings at the other TRLN libraries. Reference librarian at D. H. Hill Library. 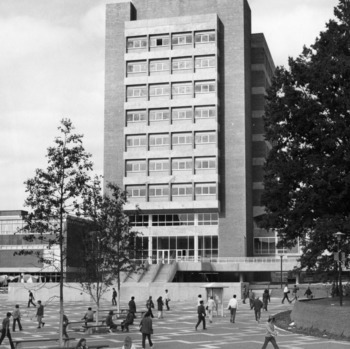 "The NCSU Libraries" becomes the official name of the library system, encompassing the D. H. Hill Library and the four branch libraries (Design, Natural Resources, Textiles, and Veterinary Medicine). The first annual I. T. Littleton Seminar in emerging library issues was held by the Libraries. 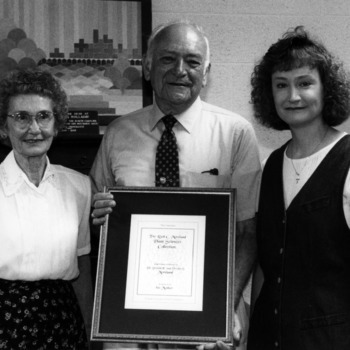 The seminar was established to honor Libraries Director I. T. Littleton, who retired in this year. NCSU Libraries began using the current logo. 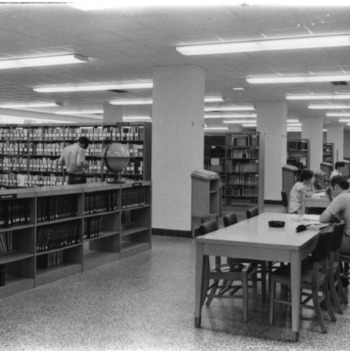 The NCSU Libraries took over administration of the University Archives. 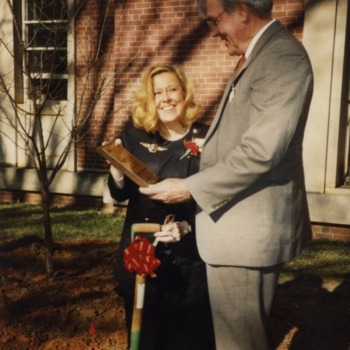 The NCSU Libraries celebrates its 100th anniversary in a ceremony that includes planting three Yoshino cherry trees in front of the east wing of the building. The library began an electronic document delivery service for university researchers. 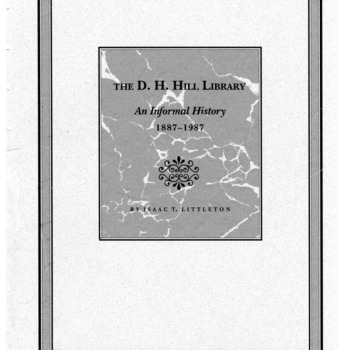 The Friends of the Library published I. T. Littleton's The D.H. Hill Library: An Informal History, 1887-1987. 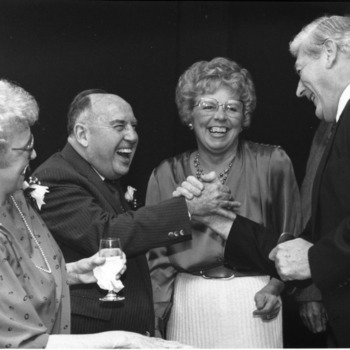 Nutter served one year as ARL president. The NCSU Libraries initiates a new online information system, accessible to remote users through campus local area networks and the Internet. 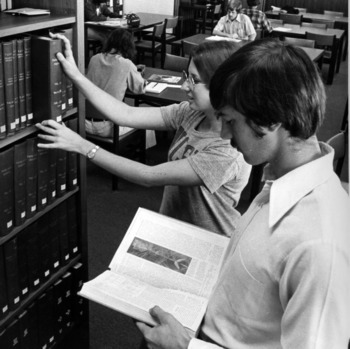 The system provided access to external databases and journal indexes, as well as the online catalog. 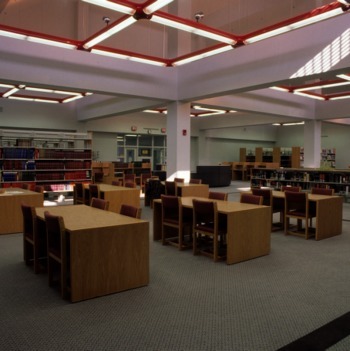 During the 1993-1994 academic year, the holdings of the Libraries reach 2,000,000 volumes. The NCSU Libraries initiated daily van delivery of library resources between the D. H. Hill Library and the branch libraries. The NCSU Libraries is selected by the Association of Research Libraries as one of six "Research Libraries of the Future." 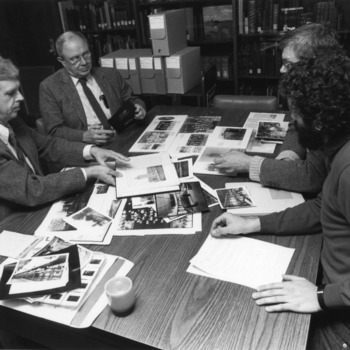 The Special Collections Research Center was established, with David Jackson as the first department leader. The Digital Library Initiatives department is formed. With funding from a tuition increase, the NCSU Libraries initiated the TRIPSaver service for NCSU users to expedite retrieval of items from other TRLN libraries. The NCSU Libraries become a charter member of the JSTOR electronic archive of journal articles. The NCSU Libraries became a member of the Digital Library Federation. The Scholarly Communication Center is established, with Peggy E. Hoon as the first Scholarly Communications Librarian. NC State's library becomes the first in the nation to hire an intellectual property attorney to help both librarians and faculty interpret how copyright law protects or limits their access to information. NC LIVE (North Carolina Libraries in Virtual Education) begins, with NC State serving as NC LIVE's primary server site. The Donald E. Moreland Associate Director for Public Services, the first named position in the NCSU Libraries, was created from an endowment established by Professor Emeritus Donald E. Moreland and his wife Verdie S. Moreland. 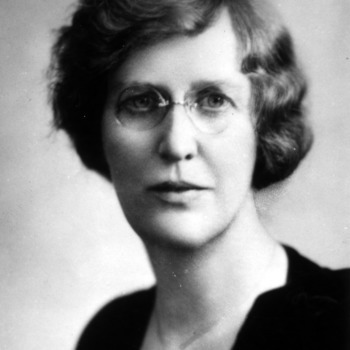 Carolyn D. Argentati became the first to hold the position. The NCSU Libraries wins the first-ever "Excellence in Academic Libraries Award" in the university library category. This award is sponsored by the Association of College and Research Libraries (ACRL). 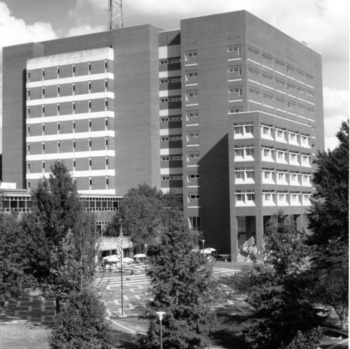 During the 2000-2001 academic year, the holdings of the NCSU Libraries reached 3,000,000 volumes. The NCSU Libraries is ranked 32nd among 112 Association of Research Library (ARL) libraries, up from 101st in 1987 - an unprecedented accomplishment in ARL history. The NCSU Libraries receives its largest gift, a $1,000,000 charitable remainder trust, from an anonymous donor. The NCSU Libraries implements a revolutionary new online catalog, leveraging the advanced search and faceted navigation capabilities of the Endeca software platform. The new catalog provides the speed and flexibility of popular online search engines, while capitalizing on the rich content of existing catalog records. The North Carolina General Assembly appropriates funding for the planning of the new James B. 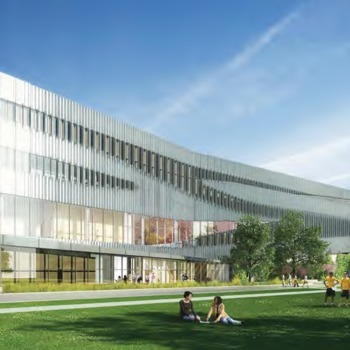 Hunt Jr. Library, to be built on Centennial Campus. A major renovation of the east wing of the D. H. Hill Library was completed, featuring the Learning Commons, the Conservatory, the Special Collections Reading Room, and the Exhibit Gallery. The opening of the newly refurbished space coincided with the fifty-second anniversary of the dedication of the original building in 1955. Vice Provost & Director of Libraries Susan K. Nutter and Associate Professor of Film Studies Marsha Gordon accepted the National Medal for Museum and Library Service at a White House ceremony in Washington, DC. This award is the nation’s highest honor for extraordinary public service, recognizing institutions that are outstanding and innovative community anchors. In particular, the award lauded community engagement events such as film screenings, panel discussions, and Gordon's “Shooting Wars” visualization project presented at the Hunt Library. Raschke became Interim Vice Provost and Director of Libraries. Raschke became Vice Provost and Director of Libraries.